This week the entertainment world is buzzing about the release of the new comic book movie, the Avengers, featuring a group of heroes from the Marvel Comic books universe working together to overcome long odds to save the world from an inter-dimensional evil genius and his extra-planetary army. Captain America, Iron Man, Thor, The Hulk, Black Widow, and Hawkeye; it’s a media reboot of the comic book characters that first began to appear in the 1940’s and continued to be promulgated with great popularity into the 1960’s and 1970’s. But there are three characters from the annals of the Avengers universe who won’t be making appearances in the film, but whose significance in the comic books go far beyond the fictional story line; do you remember Asbestos Lady, Asbestos Man, and the Human Torch? First appearing in Captain America comic in 1947, Asbestos Lady was the super villain alter ego of Virginia Murdoch. Ms. Murdoch wore an asbestos suit that could withstand the heat of fire, allowing her to create large explosions near banks that only she could venture near safely, allowing her of course to rob the bank with little resistance. 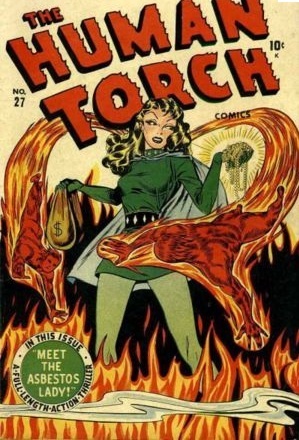 The hero, Human Torch, eventually captured Asbestos Lady by melting an asphalt road that stuck to her feat, making it impossible for her to run away. 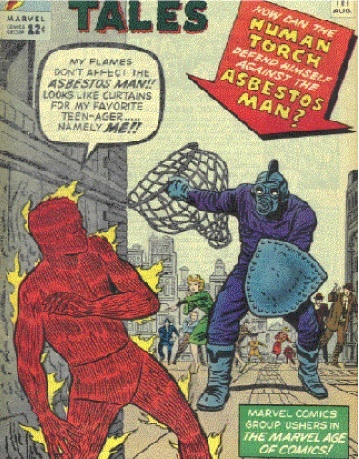 Asbestos Man first appeared as a evil super villain in the Human Torch comic book series in 1963. He was the alter ego of analytical chemist Professor Orson Kasloff. Kasloff created his asbestos suit specifically to battle the Human Torch, hoping to gain notoriety and respect from the criminal underworld. His arsenal of weapons included and net he would throw at the Human Torch, that would covert heat to explosive charges. His criminal master plot was very similar to Asbestos Lady: he robbed banks after creating infernos surrounding them. In their first encounter Asbestos Man actually defeated the Human Torch, but he was eventually captured when The Human Torch created a fire so large, that all of the oxygen in a bank disappeared, making it impossible for Asbestos Man to breathe. Asbestos Lady and Asbestos Man capture an age when people were unaware of the significant dangers associated with asbestos exposure, and children would believe the a person of high intelligence would wear asbestos fibers. An age when asbestos was used as stuffing to fill baseball gloves and football helmets. The comics are a lasting reminder of the significant cover-up perpetrated by the asbestos industry, regarding the danger associated with asbestos exposure. By the time Asbestos Lady first appeared in Marvel Comic books, in 1947, the relationship between asbestos exposure and disease was well documented. In 1932 the U.S. Bureau of Mines and Occupational Health Clinic was ready to release the results of a study revealing that 29% of asbestos industry giant Johns-Manville employees who had been exposed to asbestos had developed asbestosis that was detectable by x-ray. However, upon learning of the report, Johns-Manville used it considerable political power to stop it from being released to the public. This occurred despite the fact the epidemiological papers had been published for over 30 years documenting a relationship between asbestos exposure and disease. Tragically, the asbestos industry cover-up and conspiracy to characterize asbestos as safe, that was so effective in popular culture that it claimed the lives of millions of people who died from asbestosis, lung cancer and mesothelioma, who had unknowingly exposed themselves and their families to the dangerous mineral fiber, asbestos. If you or a family member is suffering from mesothelioma, lung cancer, or asbestosis, the Asbestos Legal Center is now offering free consultations at 1-800-970-3878.